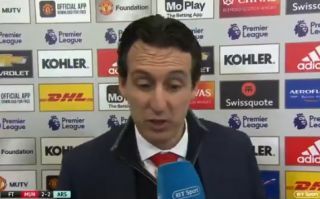 Arsenal manager Unai Emery has revealed what he told Sead Kolasinac after his terrible error gifted a goal to Manchester United ace Jesse Lingard. The Bosnian’s poor touch put Arsenal in big trouble as Lingard was able to nip in and score an easy second goal for United just moments after the Gunners had gone 2-1 up at Old Trafford. Still, Emery was sympathetic with Kolasinac as he revealed the 25-year-old was distraught after the game. Watch the video below as the Spaniard explained to BT Sport that he told Kolasinac he had a good game and that everyone makes mistakes, with this being something he can learn from. "He came in at the end with his head down." ? "I said Sead, you had a very good match, this can happen." ? Emery certainly seems to have a good positive attitude and Arsenal fans will hope he can continue to give confidence to this team as they generally look hugely improved on the last couple of years under Arsene Wenger.